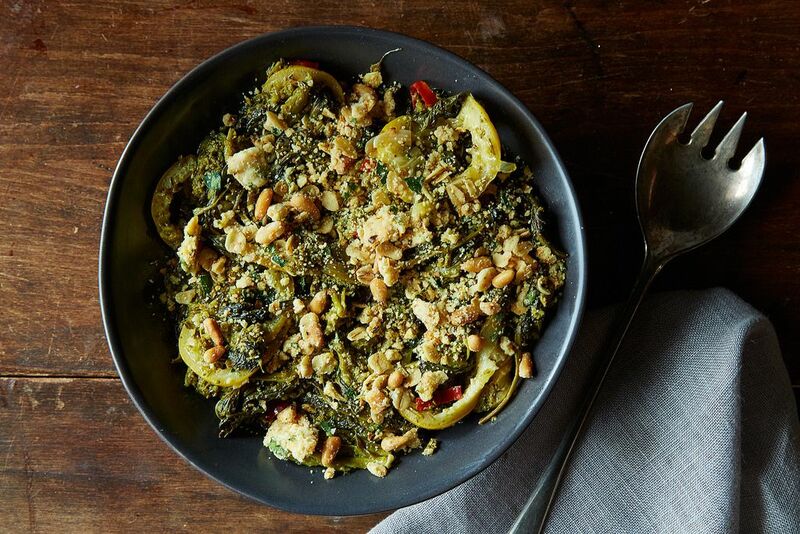 Today: Since you're not going to change the fact that broccoli rabe is bitter, you might as well embrace it. The easiest, perhaps most natural way to approach a flaw in personality or appearance is to hide it, to use Instagram and text messaging, Spanx and concealer, to create a barrier between who you really are (and what you really look like) and how the world perceives you. A different coping mechanism is to eliminate the word “flaw” from your vocabulary, to call yourself a perfectionist rather than a worrywart and to call that spot on your chin a beauty mark rather than a mole (to follow Cindy Crawford rather than Enrique Iglesias). Most of us play midfield, running back and forth between deception and honesty in a test of endurance. You don’t answer truthfully when asked to name your biggest weakness in an interview (unless you’re this guy), but you also let a few select people see your most vulnerable, 5:30 A.M. self. We find ourselves asking the same question—just how real can I be?—with bitter (broccoli rabe, our subject today), vilified (kale, now that the tables have turned), and slightly unattractive or socially inept (fennel, in my opinion) vegetables. They get charred to oblivion or submerged in cream or smothered by sheets of lasagna noodles—their hair gets teased, their legs get waxed, their Twitter feed gets violently censored—so that we don’t have to face how they really taste. We think we know these vegetables, but we keep a comfortable distance. Here, broccoli rabe gets the olive oil treatment. Nearly an hour of soaking in hot oil results in soft and shiny leaves that practically disintegrate into the garlic- and lemon-flavored oil and stems that retain their crunch but yield to your bite a bit more easily. And yet, the rabe doesn’t emerge from this olive oil facial a new vegetable, but rather as a slightly more relaxed version of itself. It’s got a bitterness you can’t braise out. 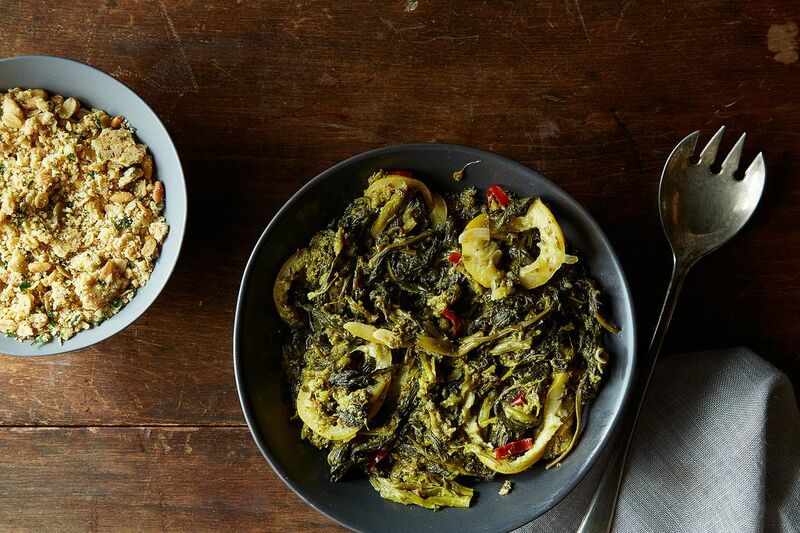 But even though this dish doesn’t rely on cream or heavy spice or starch as buffers for the greens' bitter flavors, it’s not disarmingly honest, either. (There’s only so much reality we humans can handle, and we have world events to reckon with.) Top it with a pine nut crumble—a savory granola made of pignolis, butter, oats, parsley, and lemon zest that you bake in the oven while the broccoli mellows on the stove—to add toasty, crunchy bits to an otherwise soft dish. You'll find yourself sprinkling the leftovers on top of salads or soup, like baby croutons, or eating it by the spoonful. Use it to top any texturally tiresome vegetable (I like to add more finely chopped herbs to the crumble before it bakes and then pour it over roasted carrots). 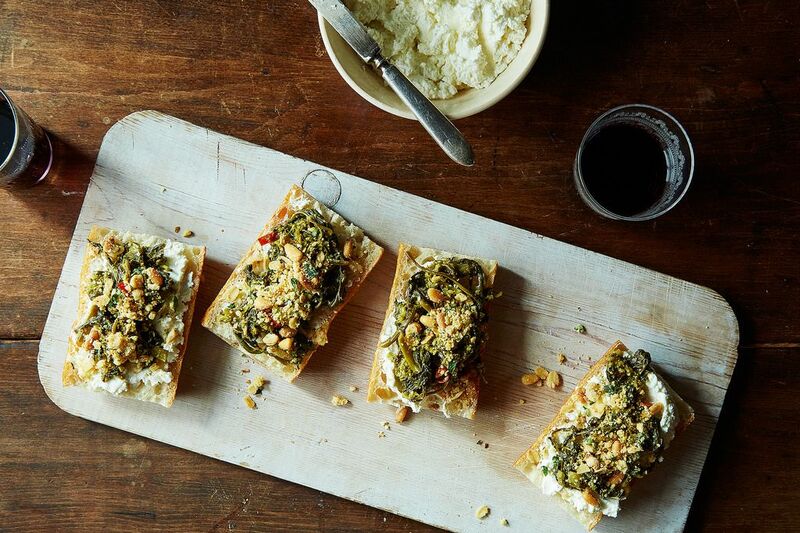 And because I am still vulnerable to the urge to cover and conceal—and because I love ricotta—I prefer to either top the rabe with hefty blobs of cheese or to spread the ricotta on toast and then lay the greens overtop, showering the bread with crumble. It's still bitter, but it's also creamy and crunchy and bready. And that's as real with broccoli rabe as I'm going to get. The title of this. And the taste of this. So so good. Wow, you're so right! I've got to change that.